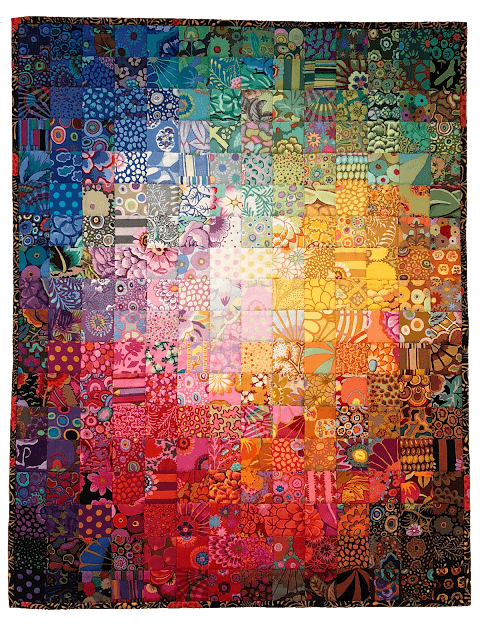 I made a Colorwash of exclusively Kaffe Fassett fabrics many of which are early and out of print. It is not the Kaffe Collective which includes fabric by Brandon Mably and Philip Jacobs. It is exclusively Kaffe. This wallhanging is made from the kit of 2.5" squares that will be offered to students of Colorwash 360. I used one of the larger prints on the back and I thought the black Fern print was perfect for the binding. That is 210 squares of glorious color! Such a pretty colorwash, I can see it hanging above my bed. I am so ready for this class. I would send money today if you would allow that. I love the sample today. As I have said before, I'd love to shop for fabrics in your stash. That is lovely. Colorwash quilts have always fascinated me. I hope to be able to join your class. This is great that you will be doing your color class online....!!!! Are the fabrics in the Kaffe kit the exact same ones as in your sample? Will you be selling your sample once the class is done? I have a colorwash quilt in the queue but I am going to try and do a self portrait wall hanging. It is the germ of an idea and who knows where it will take me. This is my absolute favorite of all your colorwash quilts! I am so exited that you are offering a online course. Yes, Loretta, those are the fabrics from the kit although not every cut from a fabric will have the same motifs in it so each kit is a tiny bit different because of that. 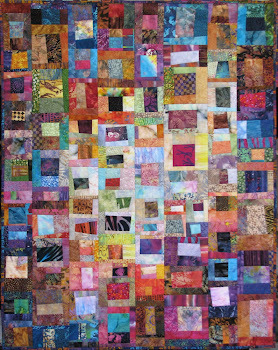 This is my opinion of the perfect looking quilt. Fun to snuggle under and find all the interesting shapes and items in amazing colors. The only thing that could make it better is if it were larger. Are there instructions available for doubling the size if 2 kits are purchased? 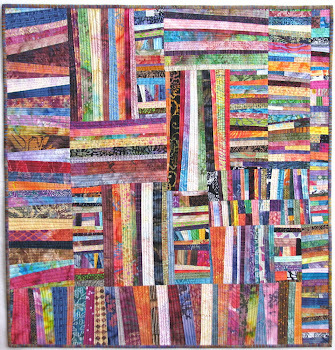 I love your colorwash quilts and this quilt is beautiful. Do you ever mix batik fabrics with print fabrics like Kaffe? If so, how? If not, why? I am so looking forward to your class. Thank you for sharing.